The eco friendly promotional coasters shown below include products made from recycled, reclaimed and natural materials. Typical recycled materials include plastics and tyres. Eco friendly coasters are popular for office-based promotions looking to enhance a more sensible approach to the environment. These eco coasters offer an impressive imprint area and a choice of colour options to provide a great contrast to your imprint and logo. Standard shapes are round and rectangular with an option for custom bespoke design shapes. We can supply custom or bespoke eco coasters as a project but please keep in mind that the manufacturing quantity has to be large enough to absorb the overhead of any special tools and also to achieve a low enough unit cost to be economically viable. How hard wearing are eco coasters? In our experience an eco coaster will wear just as well as a standard material product provided it is not treated to extreme treatment. This is the standard care you would place on any type of coaster and would include not placing a hot pan for example on a plastic item to avoid melting. What materials are your eco friendly coasters made from? 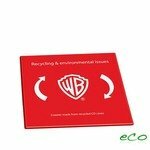 There are various materials used for the eco coasters we supply. The exact details will be described on each product page. Typical examples include recycled plastics, car tyres and paper as well as natural and sustainably farmed sources including wood and bamboo.